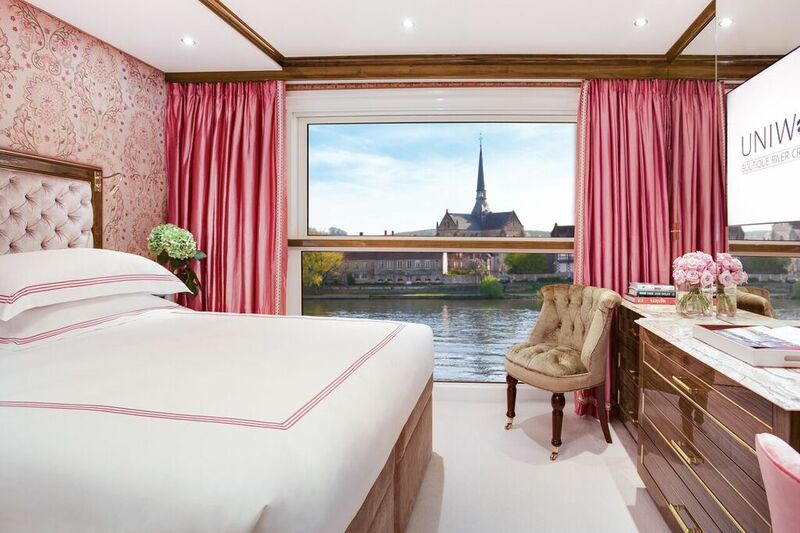 Uniworld Boutique River Cruise Collection’s newest Super Ship, the S.S. Joie de Vivre, has set sail on its maiden voyage along the historic Seine River. The inaugural events included a christening ceremony in Paris led by the ship’s Godmother, Dame Joan Collins on Monday 27 March. Following the event, the S.S. Joie de Vivre embarked on its journey through Northern France along Uniworld’s Paris & Normandy itinerary, with unique programming in celebration of the highly anticipated launch. With a length of 125 metres, rather than the typical 135 metres, the S.S. Joie de Vivre can conveniently dock in the heart of Paris in the shadow of its most beloved landmark, the Eiffel Tower. The ship has two Royal Suites, eight Junior Suites, and 54 staterooms for a maximum capacity of 128 guests. Sailings on the S.S. Joie de Vivre in 2017 run from 2 April to 27 December. The family-run design team from Uniworld’s sister brand, Red Carnation Hotels, has bestowed their creative talents on the S.S. Joie de Vivre with bright, colorful and classic design and décor inspired by 20th Century Parisian influence from the Golden Twenties to the free-spirited Sixties, all blending seamlessly with modern conveniences. The ship features a design influenced by its destination and reminiscent of the finest super yachts across the globe, including highly-polished wood finishes throughout the vessel, each surrounded by luxurious fabrics and carpets in a minimalistic setting. Farm-to-table cuisine and superb local wines are on display throughout the ship’s culinary venues, including Restaurant Le Pigalle, Salon Toulouse, Le Bistrot. Le Cave des Vins is the S.S Joie de Vivre’s hidden gem – an intimate venue for an exclusive hands-on dining experience. Guests select fresh ingredients and prepare a seven-course meal with the ship’s onboard chefs, with French wine pairings from the sommelier. Passengers are invited to relax and indulge their senses at Club L’Esprit, the onboard spa and wellness venue. Club L’Esprit offers a variety of massage therapies and beauty treatments, as well as a fitness center. Yoga sessions and aquatic fitness classes are also offered daily and refreshing smoothies are served in the L’Esprit Bar. A pool with a hydraulic floor transforms the space from day to night for guest entertainment. By night the venue becomes Claude’s and offers an authentic French Supper Club experience, serving delicious delights from a tapas menu accompanied by curated cocktails with live music. For a few nights throughout the duration of the journey, Claude’s presents classic French cinema under the stars. The S.S. Joie De Vivre joins the Uniworld fleet which feature all-inclusive itineraries in Europe, as well as voyages in Russia, China, India, Egypt, Vietnam and Cambodia – a total of 22 rivers in 26 countries worldwide. For more details or booking, visit uniworld.com. Follow the inaugural sailing on Uniworld’s social media community at facebook.com/uniworldrivercruises, instagram.com/uniworldcruises or twitter.com/Uniworld_UK using the hashtag #ExperienceJDV. Uniworld Boutique River Cruise Collection – the world’s most luxurious all-inclusive river cruise line – features luxurious ships with an average capacity of 130 guests, exclusive excursions, gourmet cuisine, and one of the highest staff-to-guest ratio in the river cruise industry. Based in Los Angeles, California, Uniworld offers truly all-inclusive itineraries in Europe, as well as voyages in Russia, China, Vietnam and Cambodia, India, and Egypt – a total of 22 rivers in 26 countries worldwide. In 2018, Uniworld will launch U BY UNIWORLD, a new brand for 18 to 40 year old adventure seekers, featuring two renovated ships that will sail to cities such as Amsterdam, Budapest and Paris. Uniworld is a member of CLIA and is highly regarded by discerning travelers, media, and cruise industry experts, having most recently been named the #1 River Cruise Line in the Travel + Leisure World’s Best Awards 2016 readers’ survey. Created as a joint initiative between The Travel Corporation’s (TTC) family of brands, the TreadRight Foundation is a not-for-profit that works to help ensure the environment and communities they visit remain for generations to come. To date, TreadRight has supported some 40 sustainable tourism projects worldwide. To learn more about our past and current work at TreadRight, visit TreadRight.org.